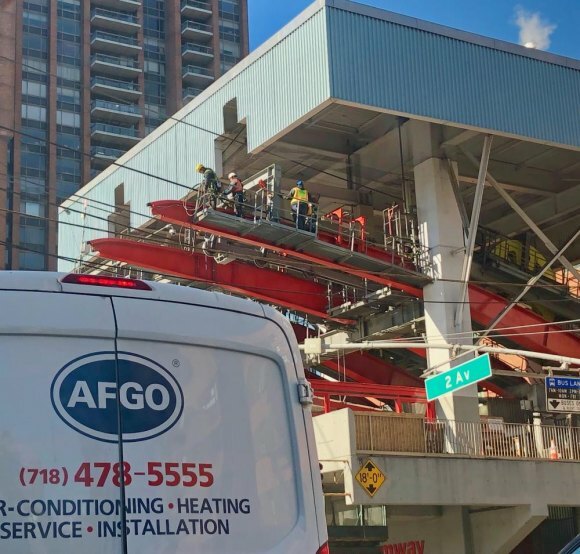 On a chilly Tuesday morning, Leitner-Poma was at work on the Manhattan Tram Plaza. "I suggested that we move forward on Sunday," RIOC CFO John O'Reilly told The Daily, "with short notice based on the fact the move would place the project back on a definitive schedule which gave us a base line to monitor progress, as well as, having the least amount of disruption for commuters." He was referring to the last minute call to shut down the Tram completely on Sunday. And, as it turns out, probably the next several Sundays. "Susan made the final call after the team collaborated the pros and cons of such a move," he added. Brought in as Chief Financial Officer partly because his career duties as an executive have included substantial experience with construction projects, a major concern for RIOC under President/CEO Susan Rosenthal, who's all in for catching up on neglected infrastructure work. RIOC met for the first time with Leitner-Poma's lead engineer on the Tram upgrade project on Wednesday. Preparatory work was already underway and operations down to a single cabin. With an eye on completing the work as soon as possible, RIOC's team asked when he would be prepared for mandatory cable work on which the Tram's safety and reliability depend. Risks for passengers waiting to board on the central platform was too high with work going on almost directly overhead. A new way of structuring waiting lines had to be devised that reduced platform congestion and its dangers. It was full speed ahead for Sunday, everyone eager to get the major phase of the work started and completed within the window of available time. The unexpected is always a gamble and when engineers, their minds geared to nuts and bolts, not so much on people, dig in. Sometimes they find things. Other times, like in this case, they know all along but don't tell anyone. What Leitner-Poma's engineers told RIOC, late Friday, far too late to inform residents in a timely fashion, was that Sunday's work would require a complete shutdown. As O'Reilly explained it, there were choices. They could bump the project back a week to give RIOC time to better prepare. Or, they could move the shutdown into the work week, an idea that was dead on arrival. A go ahead decision for Sunday, keeping the project on schedule, was made, sending Cy Opperman scrambling to find drivers available for shuttle bus services on extremely short notice and Jessica Murray racing to compose coherent press releases and public notices. Both did well under pressure, although Murray had no choice but to contradict her earlier promise of 48-hour minimum notices within an hour and a half. Mapping out what comes next carried on into this week, now with more time for planning and sharing information. Currently, to keep the project on schedule, shutdowns for at least the next three Sundays are anticipated, although final confirmation from RIOC hasn't been received. The State agency is also looking into how to best deploy shuttle buses and developing strategies to monitor unplanned disruptions in subway service, three of which happened during the first week of the Tram shutdown, each fortunately brief.